IDJ has sent this account, published in 1908, of Messrs. F Blackhead & Co.’s Soap and Soda Factory which was established in Shau Kei Wan around 1896. As IDJ points out the article is mistaken in suggesting that the distance between the city of Victoria (essentially Central) and Shau Kei Wan is two miles – it is at least seven as the crow flies. HF: I have added two further sources of information about the Soap Factory. “No account of the industrial life of the Colony would be complete without a passing reference to the manufacture of soap, which is a comparatively new enterprise so far as Europeans are concerned. The idea of start­ing a soap factory in Hong Kong originated, some twelve years ago, with Mr. Smith, a former partner in the firm of Messrs. F. Blackhead & Co. An admirable site was purchased at Shaukiwan, a little village about two miles east of the city of Victoria, and upon this some excellent buildings were erected and equipped with the necessary machinery, including large boilers made by the Hong Kong and Whampoa Dock Company. Under the capable supervision of a gentleman who had formerly been connected with the soap trade in Japan, operations were quickly in full swing. The proprietors found that competition with Japanese, Chinese, and im­ported soaps was very strong, but, in spite of many difficulties, they have made gratifying progress by producing an article of good quality at a moderate price. From time to time the plant has been added to, and often between sixty and seventy Chinese are em­ployed, for, besides the manufacture of all kinds of soap, soda crystals and disinfectants are also made. The raw materials are obtained from the Philippines and adjacent islands. After the various ingredients have been analysed carefully by competent chemists to test their purity, they are slowly boiled and stirred for a given length of time. The liquid is then forced, by a rotation pump, into collapsible iron forms. Here it is allowed to cool, and, when the sides of the forms are taken away, the solid blocks of soap remain. In the manufacture of some soap great care has to be taken to ensure that it does not cool too quickly. When the solid block of soap, weighing about two tons, is obtained from its iron form it is cut, by wire, into convenient sizes, and then by a simple little machine is converted into whatever shape may be desired. A Chinese coolie, with a hand machine, stamps the tablet with the required design, and the soap is then ready for the market. As early as the 19th century, the Chinese have been manufacturing soap but the British company F. Blackhead & Co’s Soap Factory produced it with advanced machinery and technology. 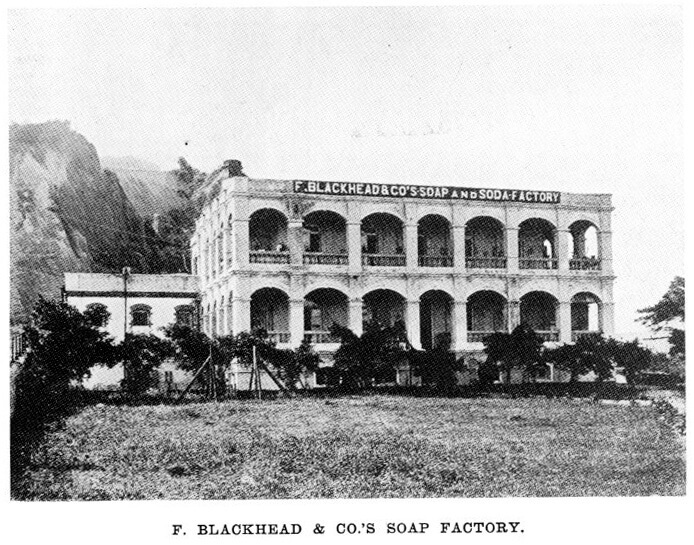 In 1896, Mr. Smith, a partner of Messrs. F. Blackhead & Co., established a factory that manufactured soap. The company purchased a land lot in Shau Kei Wan for the factory. The boiler in the factory was purchased from Whampoa Docks. The manager was a westerner who hired 60 to 70 Chinese workers under him.